Today’s article about music creation in DAW REAPER will be devoted to May it Be composition of Enya, which also was used in The Lord of the Rings film. 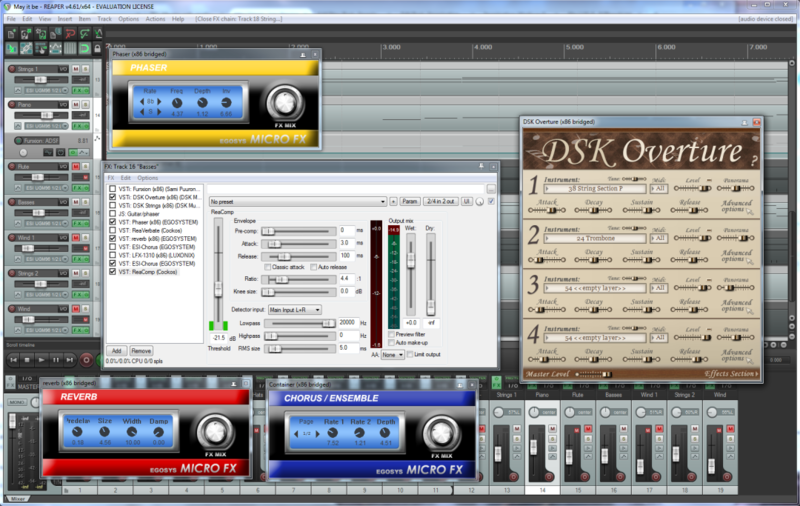 For its creation I downloaded MIDI notes from Internet, thank you goes to their original author, used large amount of instruments and effects and in final version left only sampler synthesizer DSK Overture and effects ESI Chorus, Reverberation and Phaser and built-in compressor to keep basses dynamic range in control. In the source MIDI file there is large amount of tracks, which with rich for frequencies and movement sounds of DAW produce mess, so I left only 4 of them : main strings instruments, flute ( main instrument ), basses and additional strings instruments, which play only in key parts for their strengthening. To make sounds of main and additional strings instruments do not create dissonance, I separated them by stereo channels, this also added volume to composition : to the left there are one instruments, to the right – others. Completed composition in FLAC format, along with project source file and sounds, can be downloaded via this link : May it Be, Enya, The Lord of the Rings in DAW REAPER. Source tracks’ MIDI-notes have large amount of overlaps of sounds frequencies, which create audio mess; for example, tracks of string and wind instruments have notes, which move into basses area, wherein basses have notes, which ascend to middle frequencies; so, I removed from tracks all notes, that move outside of ranges. Then applied to sampled synthesized sounds of strings and wind instruments low-pass filters with high cut-off frequency, so that they’ll not move into high frequencies range to main instrument domain – flute. For it I used large amount of different instruments : piano, synthesized flute ( it even sounds more or less good and fits composition ) and other instruments, but exactly sampled synthesized flute sounds fit composition the most. In some of its notes’ sounds there are tambourines, but there is nothing to do about it : instrument is free and high quality in all other respects; clean quality can be obtained with paid sampled synthesized instruments, which use Sound Font samples. There were also large amount of experiments with instruments, effects and their parameters to balance composition and make it sound good ( for example, use of envelope’s Release parameter automation of synthesized in Funxion flute, to make it sound longer at the ends of notes groups, than at the ends of notes inside groups ), I did not described all of them to not increase article size 2 – 3 times and shown only final result. In process of composition creation there were large amount of listens, adjustments makings and listens again till composition started to sound in a needed way; then instruments’ volumes balancing, to make them sound together instead of silencing each other, for example, I decreased basses volume, because this composition is not with a basses power, but a melodic one. 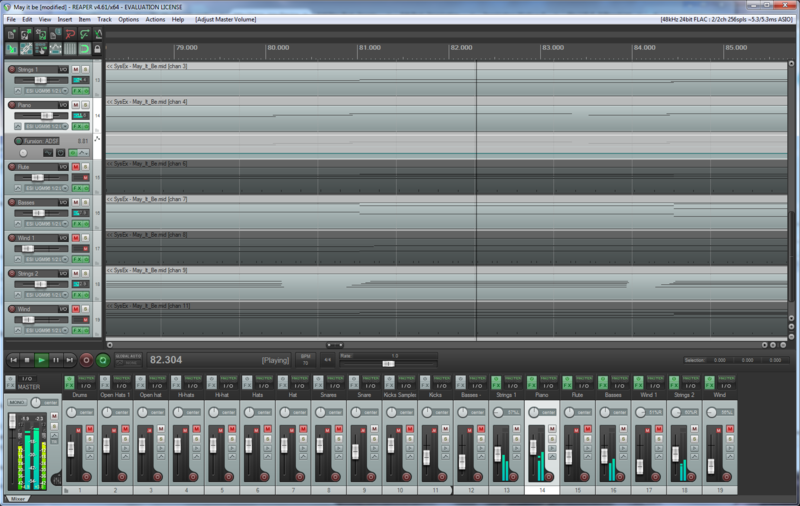 Then a few amount of tweaks and composition started to sound good enough. This is it for today, check details in project’s file and ask questions in comments, if you have ones. Next time I’ll create variation of other composition to continue development in this area, see you next time. 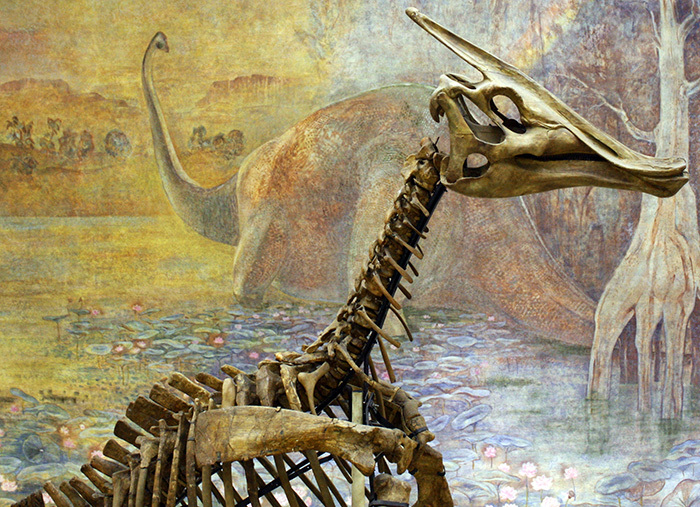 In a late Cretaceous period 70 – 68 millions of years ago on territory of modern North America and Mongolia ( probably, in other areas of the world too ) lived duck billed dinosaurs saurolophus with small crest located at 45 degrees on the back of the head. They were herbivorous and were able to eat plants on ground level and up to 4 m above it; they moved on 2 and 4 legs; their maximal length was 12 m and maximal mass was 1.9 tons. Crest may had many functions : thermoregulation, gender determination and as basement of skin flaps, as modern basilisk lizards have. Skull of saurolophus allowed to perform chew-like movements and grind food with large amount of teeth, which were replaced as they wear; on the sides of jaws they had cheeks, that helped them to keep food in mouth. Juvenile saurolophus had much smaller crests, then adults animals had, and it reached as they grow approximately 20% of a skull length. For the first time dinosaurs of this species were found in 1912 year by paleontologist Barnum Brown in Canada; also large amount of complete skeletons and their fragments were discovered in Gobi desert area in 1946 – 1949 years by expedition of Russian and Mongolian scientists, which later were described by Anatoly Rozhdestvenskiy. 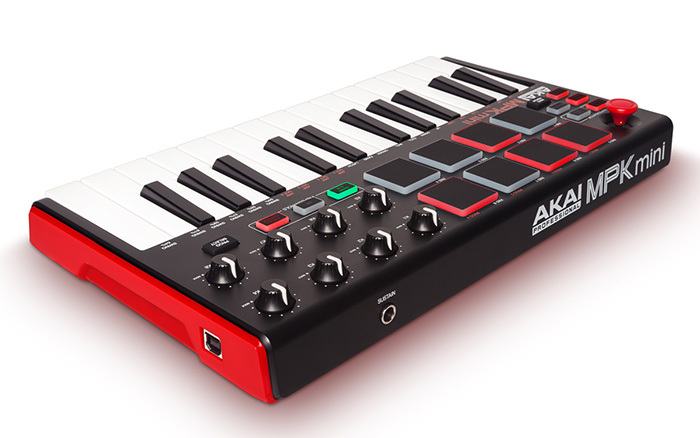 One of the Akai’s MIDI keyboards is a device Professional MPK Mini MKII 25 with 8 velocity and pressure sensitive drumpads with backlight and velocity-sensitive keys on 2 octaves. It also has : joystick with 4 movement directions for pitch and modulation control; 8 assignable knobs; built-in arpreggiator; buttons for octaves control, Note Repeat, Full Level and Tap Tempo; 1/4″ jack input for Sustain pedal; and USB port for connection to computer and powering ( it does not require power adapter ). After purchase there is ability to download from manufacturer’s website following programs : Akai Pro MPC Essentials, SONiVOX Wobble, AIR Music Tech Hybrid 3 and MPK mini MIDI Editor; device works in Windows Vista, 7, 8, 8.1 and 10 and Mac OS X 10.7 and newer without additional drivers and integrates with modern DAWs Steinberg Cubase, FL Studio, Cackewalk Sonar, REAPER, Avid Pro Tools, Ableton Live and others and their VST/AU instruments and effects. Its sizes are 317.5 ( width ) x 181.1 ( depth ) x 44.5 ( height ) mm and mass is 0.79 kg. 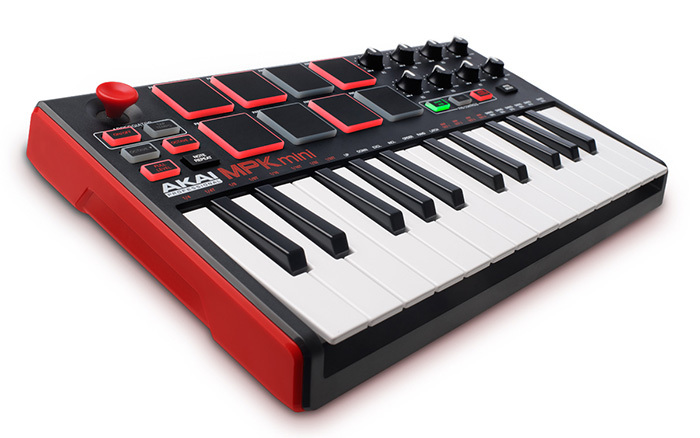 Package contains : Akai Professional MPK Mini MKII 25 MIDI keyboard itself, USB cable, warranty card and user’s guide. All in all device is good with keys on 2 octaves, 8 drumpads and large amount of assignable controls, there is also ability to look on MIDI keyboards with close keys amount of other manufacturers and choose one, which suits the best for task, in design and in price terms. 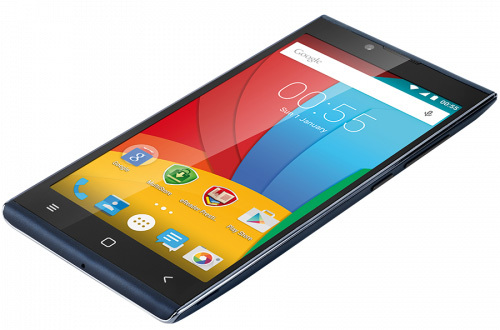 One of the new devices of Prestigio company is an Android 5.1 smartphone Grace Q5 with 5″ multitouch IPS screen with HD 720 x 1280 pixels resolution, 1 GB of RAM and GPS navigation. In it following are placed : 4-cores processor Spreadtrum SC7731, working on 1.3 GHz frequency, graphical chip Mali-400 MP2, 8 GB of on-board memory with ability to extend via Micro SD flash cards with 32 GB max size ( larger ones are, probably, also supported ) and 2 slots for SIM cards. It supports 2G ( GSM 900, 1800 and 1900 ) and 3G networks, without 4G LTE support; it has GPS+A-GPS satellite navigation and orientation and acceleration sensor. Prestigio Grace Q5 has 2 good for smartphones cameras : 8 MP main one with flash and 5 MP frontal one; it supports wireless Bluetooth and Wi-Fi ( 802.11 b/g/n ) connections for remote data transfers and communications with other devices, without NFC support. On external panels it has : USB port for connection to computer and bettery charging, 1/8″ mini jack headsets and headphones connector, power and volume control buttons and microphone and speaker. 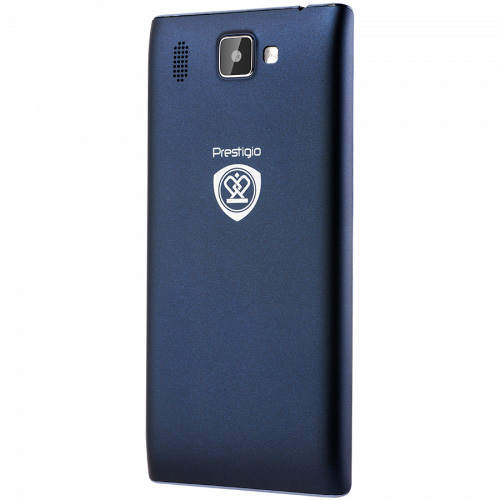 Li-pol accumulator capacity is 3200 mAh – this is a good parameter for smartphones; device’s sizes are 70.9 ( width ) x 142.5 ( height ) x 8.3 ( depth ) mm and mass is 150 g.
Package contains : Prestigio Grace Q5 smartphone itself, USB cable, recharger, warranty card and user’s guide. Smartphone is good : with large IPS screen, powerful system, good cameras and capacitive battery, its price is around 100 USD, which is quite adequate for its functions. There is need to note, that for smaller sum there is ability to buy less functional Android and Windows smartphones. One of the most advanced USB audio interfaces of Behringer company is a U-PHORIA UMC1820 – device with 18 inputs, 20 outputs, 8 MIDAS preamplifiers and support of 96 kHz and 24 bits work mode. On its frontal panel following are placed : 2 microphone/linear/instrumental Hi-Z combined XLR/TRS 1/4″ jack inputs; phantom power +48 V switch buttons for inputs 1 – 4 and 5 – 8; instrumental and linear work mode switches, PAD buttons, clip indicators and gain control buttons for each of 8 inputs with preamplifiers; outputs monitoring block with channels selection button 1-2/1-8 and mono/stereo work mode switch; 2 TRS 1/4″ jack outputs for monitor headphones, with channels selectors 1-2/3-4, ADAT/SPDIF work mode switch for digital optical connectors, MIDI input and output, power and phantom power indicators; as well as switch on button. On its back panel there are : power adapter input, USB port for connection to computer; MIDI input and output; optical digital input and output, able to work in ADAT and SPDIF modes; coaxial digital RCA input and output; 10 analogue linear TRS 1/4″ jack outputs ( 1st and 2nd are main ); and another one 6 combined XLR/TRS 1/4″ jack inputs. Dynamical range of Behringer U-PHORIA UMC1820 is a 106 dB, it draws maximum 20 W of energy; for it drivers are released for Windows XP, Vista, 7, 8, 8.1 and 10, in Mac OS X it works without additional drivers, with support of ASIO 2.0 and Core Audio interfaces, accordingly. Which allow it to work with modern DAWs : FL Studio, Cackewalk Sonar, REAPER, Avid Pro Tools, Ableton Live, Steinberg Cubase and others; its sizes are 46 ( height ) x 483 ( width ) x 130 ( depth ) mm and mass is 1.8 kg; with it DAW Tracktion is supplied. With Behringer U-PHORIA UMC1820 package contains : USB cable, power adapter, 3-years warranty card and user’s guide. All in all interface is good with large amount of connectors, high characteristics and quality inputs preamplifiers, it is suitable for large studios, for small ones there is ability to buy device with the same components quality and smaller connectors amount of Steinberg, Behringer itself, Focusrite, Roland, ESI, M-Audio and other manufacturers production. 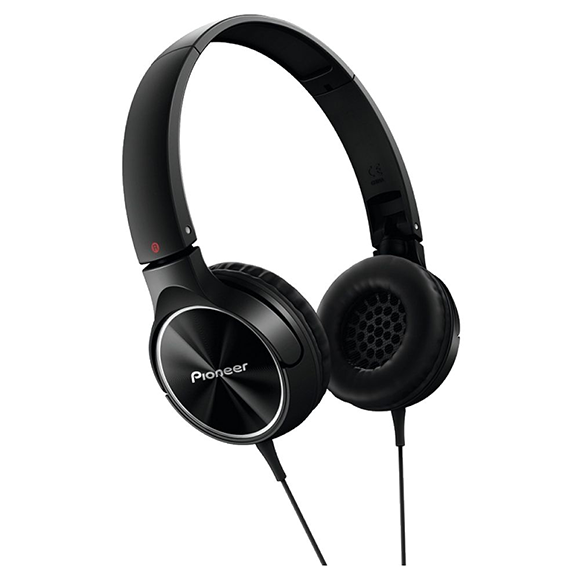 Company Pioneer presented new model of its headphones SE-MJ502T – device with 40 mm membranes, 11 Hz – 24 kHz reproducible sounds frequencies range, microphone and closed-back architecture. Their sensitivity is 103 dB, impedance is 32 Ohms, max input power is 500 mW and mass is 104 g ( without wire accounting ). Cable is attached to both cups and has 1.2 m length, in its volume control module microphone and smartphones control buttons are built in, it is connected to sound source via 1/8″ mini jack gold-plated connector. They are supplied in 2 colors variants : black and white, with Pioneer SE-MJ502T headphones themselves package contains : adapter to 1/4″ jack plug, warranty card and user’s guide. All in all, Pioneer created good device with high characteristics, there is ability to anticipate, that it will not overprice its production, as well as some other headphones manufacturers do. 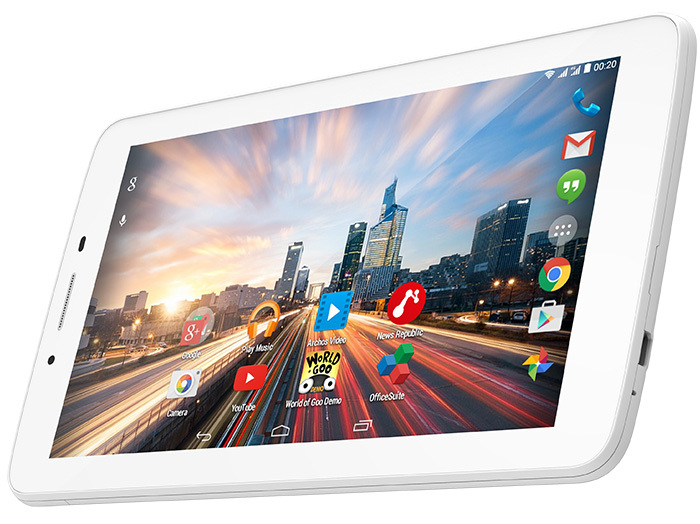 Among Android tablet PCs there is a new device : Archos 70b Helium – tablet PC under 4.4 version of this OS operation with 7″ multitouch IPS screen with 1024 x 600 pixels resolution, 4G LTE and 4-cores processor Mediatek MT8732, working on 1.5 GHz frequency. In it following are built-in : graphical chip Mali 760 MP2, 1 GB of RAM, 8 GB of on-board memory with ability to extend via Micro SD flash cards with 64 GB max size ( larger ones are, probably, also supported ) and 2 Micro SIM cards slots. Device can be used as phone with support of 2G ( GSM 850, 900, 1800 and 1900 ), 3G and 4G LTE networks; it supports satellite navigation system GPS+A-GPS and gravity and acceleration, lighting and proximity sensors are built into it. 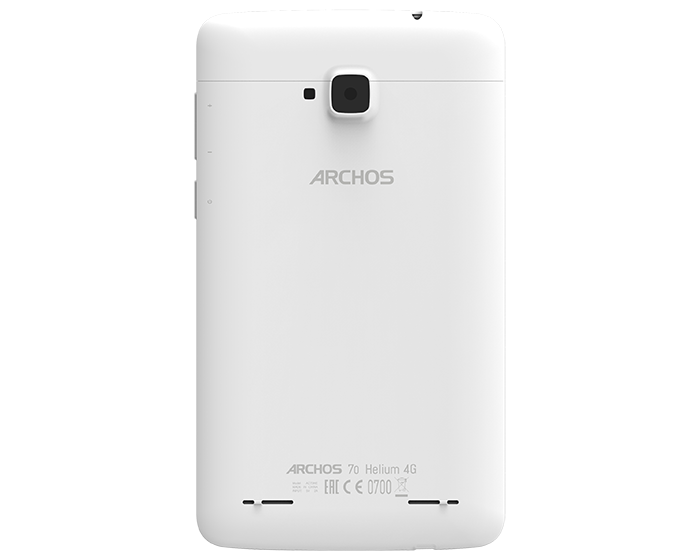 In Archos 70b Helium two average for tablet PCs cameras are placed : 5 MP main one ( with support of Full HD 1080p video recording ) and 2 MP frontal one; it supports wireless Bluetooth ( +Bluetooth Smart Ready ) and Wi-fi ( +Direct ) connections for remote data transfers and communications with other devices, without NFC support. On external panels it has : Micro USB 2.0 port for connection to computer, external devices plugging-in and battery charging, 1/8″ mini jack headsets and headphones connector, power and volume control buttons and microphone and speaker. Device’s body is made from plastic, its sizes are 188 ( width ) x 109 ( height ) x 10 ( depth ) mm and mass is 278 g. Charge of Li-pol battery is 2500 mAh – this is a very small parameter for tablet PCs and with 4-cores processor it will be enough for maximum 2 – 4 hours of intensive work. Package contains : Archos 70b Helium tablet PC itself, USB cable, recharger, warranty card and user’s guide. From one side : tablet has 4G, 4-cores processor and not bad cameras; from the other : it has very small battery charge, 4-cores processor with 1 GB of RAM is not needed, 2-cores here is quite enough, and cameras of tablet PCs will not give high quality photos and videos due to small sensors and lens anyway. Wherein for much smaller sum there is ability to buy Android tablet PCs with 2-cores processors, 3G ( 4G often is not needed and previous connection standard is enough ), weaker cameras and much more capacitive batteries; also for much smaller sum there is ability to buy Windows tablet PCs with 4-cores processor Intel Atom, working on 1.83 GHz frequency, 16 GB of on-board memory and much more capacitive batteries. So, overall, it is better to not buy this tablet and look on other devices. Company Samsung presented new Galaxy S7 and S7 Edge smartphones with 5.1″ and 5.5″ multi touch AMOLED screens with 2560 x 1440 pixels resolution, OS Android 6.0 and metallic body. In them following are built-in : 8-cores processor, 4 GB of RAM, 32 or 64 GB of built-in memory ( depending on modification ) with ability to extend via Micro SD flash cards with 200 GB max capacity and 2 SIM cards slots ( one of them is combined with flash card slot ). Smartphones can work in 2G ( GSM 900, 1800 and 1900 ), 3G and 4G LTE networks; GPS satellite navigation and lighting, proximity and Hall sensors, gyroscope, compass, barometer and finger prints scanner are added to them. In Samsung Galaxy S7 and S7 Edge two good for smartphones cameras are placed : 12 MP main one with LED flash and 5 MP frontal one with light-strong f/1.7 lenses; they support wireless Wi-Fi ( 802.11 b/g/n/ac ), Bluetooth 4.2 and NFC connections for remote data transfers and communications with other devices. On their external panels following can be found : Micro USB port for connection to computer, external devices plugging in and battery charging; 1/8″ mini jack headsets and headphones connector, speaker and microphone and buttons for powering and volume control. 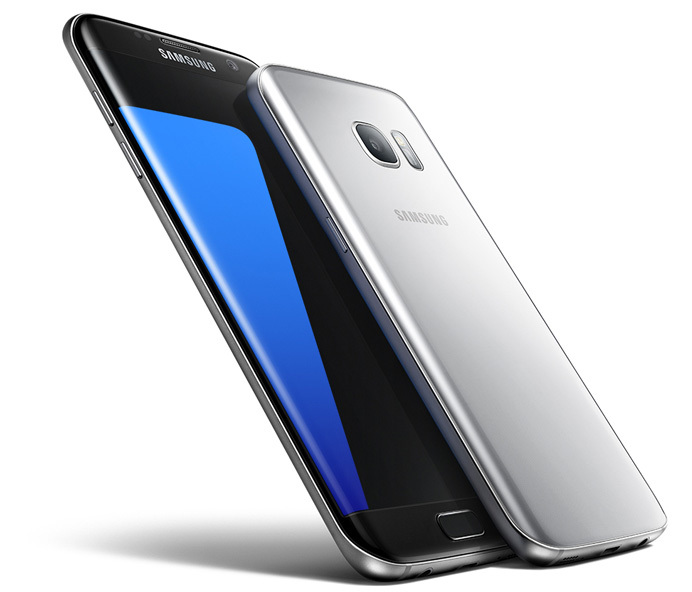 Devices’ body is made from metal and glass, screen’s glass is tough and their bodies are water and dust proof; Samsung Galaxy S7 and S7 Edge sizes are 69.6 ( width ) x 142.4 ( height ) x 7.9 ( depth ) mm and 72.6 ( width ) x 150.9 ( height ) x 7.7 ( depth ) mm and masses are 152 and 157 g. Their batteries capacities are : 3000 and 3600 mAh, with remote charging support, these are good parameters for smartphones. Package contains : Samsung Galaxy S7 or S7 Edge smartphone itself, USB cable, recharger, headset, warranty card and user’s guide. Smartphones are great : with large screen, powerful system, tough body and good cameras; currently they are available for pre-order and will show up in shops at 11 March of this year; taking into account their characteristics, there is ability to anticipate very high price on them : its is quite possible, that it is better to buy quality Android or Windows smartphone with not so advanced characteristics and good tablet PC or camera with interchangeable lenses, or them both, maybe even cheaper. Among audio interfaces of new generation there are devices, working through Thunderbolt connection, for example, Focusrite Clarett 2Pre – interface with 192 kHz, 24 bits and dynamic range up to 119 dB. Thunderbolt – is a new connection standard, developed by Intel company and giving throughput 20 Gbits/s, thereby it releases limits of USB 2.0 connection on channels amount, sampling rate and precision per sample. On frontal panel there are : 2 combined XLR/TRS 1/4″ jack connectors with gain control knobs with back light and instrumental Hi-Z work mode, AIR function and phantom power +48 V switches with indicators for both of them; main outputs volume control knob; power, Thunderbolt connection and device blocking indicators; and TRS 1/4″ jack monitor headphones output with volume control. On back panel there are : power button, power adapter input, Thunderbolt input, optical digital input, MIDI input and output and 4 linear TRS 1/4″ jack analogue balanced outputs. Inputs of Focusrite Clarett 2Pre in microphone mode have following characteristics : THD+N 0.001 % and noise level -128 dB; in linear : THD+N 0.001 % and dynamic range 118 dB; in instrumental : THD+N 0.001 % and dynamic range 116 dB. Linear outputs : THD+N 0.0007 % and dynamic range 119 dB, monitor headphones output : THD+N 0.0008 % and dynamic range 116 dB. With it following are supplied : Focusrite Control mixer, VST plugins Softube Time and Tone Bundle, TSAR-1R Reverb, Tube Delay and Saturation Knob and AAX, AU and VST Red 2 and Red 3 plugins. 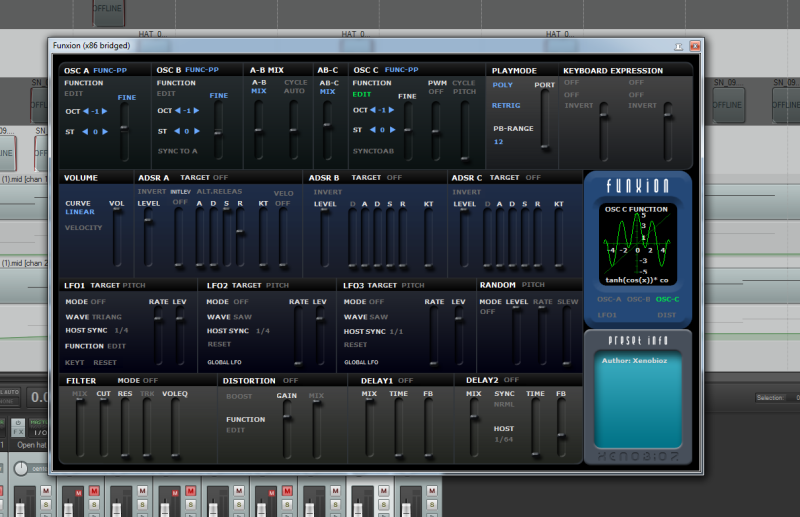 Currently device works only in Mac OS X 10.9 and newer, manufacturer promises support of Windows in near time, in Apple‘s OS it works with support of Core Audio interface, via which it can interact with modern DAWs : Avid Pro Tools, Ableton Live, Steinberg Cubase, FL Studio, Cackewalk Sonar, REAPER and others. Its body is made from aluminum with beautiful scarlet color. Package contains : Thunderbolt audio interface Focusrite Clarett 2Pre itself, warranty card and user’s guide; Thunderbolt cable should be bought separately. All in all interface is good, provides high dynamic range of digital to analogue and analogue to digital conversions and small THD+N level; from the other side : in 2 inputs audio interfaces class there are great USB devices ( of Steinberg, Behringer, Focusrite itself, Roland, ESI, M-Audio and other manufacturers production ), which handle their tasks, work in Windows and cost less. So in entry-level audio interfaces class it is better to buy USB devices and look on Thunderbolt interfaces only in classes of middle and large devices. 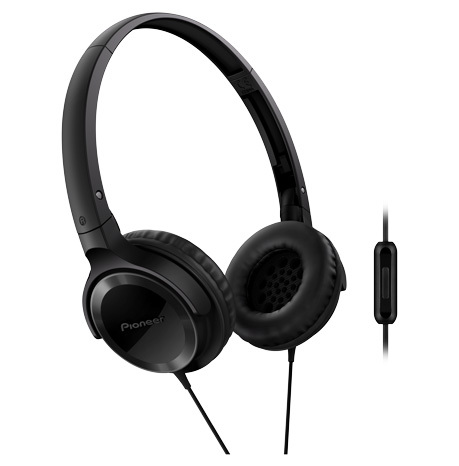 Company Pioneer continues to rejoice with great headphones and presents SE-MJ522T – 40 mm monitor headphones with 10 Hz – 28 kHz reproducible sounds frequencies, microphone and closed back architecture. Their sensitivity is 105 dB, impedance is 32 Ohms, maximal input power 1000 mW and mass is 105 g ( these are light headphones ). To both cups 1.2 m cable is connected with microphone and smartphones control buttons, placed in volume control module, and 1/8″ mini jack gold-plated connector. Package contains : Pioneer SE-MJ522T headphones themselves, adapter to 1/4″ jack plug, warranty card and user’s guide. Headphones are great, they have large diaphragms, very wide frequencies range and good other characteristics, wherein they cost around 20 USD : all in all Pioneer is one the top and does not overprice its devices, as well as some other headphones manufacturers do.